What is the worst thing that could happen to you? For Mark Carpen, it is the death of his children at the hands of a drunk driver. In the tragic aftermath, he also loses his wife, his job and everything else of value. Grief stricken, Mark turns his back on society for a life wandering through the North Georgia woods. That is until he finds a strange watch in the middle of those woods. A very special watch. One that gives its wearer the power to travel through time at will rectifying past wrongs and stopping tragedies before they happen. Mark is determined to use the watch to save his kids, yet certain mysterious forces are poised to stand in his way and a shadowy group of assassins has decided that Mark Carpen must die. Zack Mason changes history with his novel, Shift. From creating time paradoxes to accruing billions of dollars, the main character Mark stays busy in various historical eras. Mark's character is an easy one to connect with. Who can't like a guy who would focus on saving his kids from death after stumbling across a time-travel device? Mason writes his character perfectly to make readers immediately form a friendship with Mark. After Mark discovers that his kids are fated to die, he focuses all of his attention on saving random people throughout history from horrible occurrences. The plot that Mason crafts is full of historical references and Mark intervenes, often changing history. From the Vietnam war to the Kennedy assassination, Mark and his cohorts are present trying to alter what happens. When an IRS agent catches on to what Mark is doing, because of his large sums of money, he tries to stop Mark by going into the future and stealing the watches from Mark's two friends. As the story develops, things get a bit chaotic for Mark and his friends, Hardy and Ty. A little foreshadowing on Mason's part muddles the future for the three heroes of history. As the first installment in a trilogy, this book sets up readers for the long haul. Recommended for anyone who is interested in history and time travel, especially men - as male readers will further connect with Mark based on his circumstances. P.S. 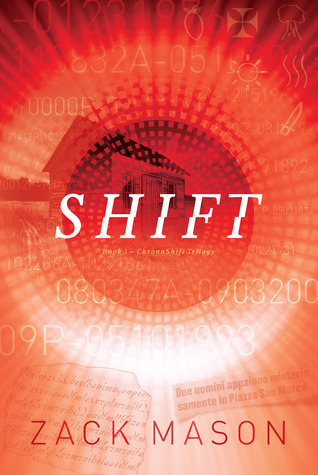 After reading the novel, definitely go play around on www.chrono-shift.com to try and crack the code. The work that went into this website is amazing and quite fun.